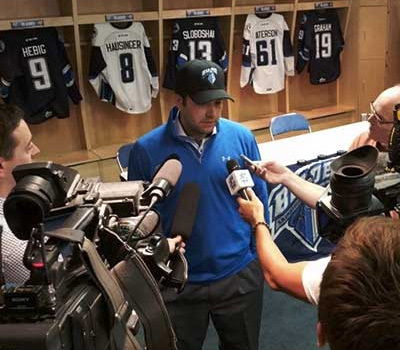 Bryce Thoma (BComm'06) has been named assistant coach of the Saskatoon Blades of the Western Hockey League (WHL). Thoma most recently served as the general manager and head coach of the Weyburn Red Wings of the Saskatchewan Junior Hockey League (SJHL). His coaching experience also includes five seasons as an assistant with the WHL’s Red Deer Rebels. Prior to his time at the U of S, Thoma won a Memorial Cup as a player with the Rebels in 2001. With the Huskies, Thoma manned the blueline for three seasons, spanning almost 100 games before playing professionally. Read more on Thoma joining the Blades.